For one minister - an enthusiast for Brexit - it was very simple: "You're either on board, or you're not. He wasn't. We move on." The minister sounded rather cheerful. So, Sir Ivan Rogers had gone because his face didn't fit. Now the way was clear for a true believer in the opportunities opened up by the vote to leave the EU. If only winning a good deal for Britain in its divorce from the European Union, and eventually on the terms of trade for the UK outside the EU, was half so simple. 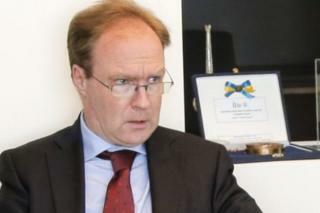 But the resignation of Sir Ivan Rogers has revealed more than the difficulty and complexity of Britain's EU divorce. It has highlighted wider strains in Whitehall between some mandarins and some ministers, up to and including Theresa May. Mandarins and ambassadors perennially advise more junior mandarins on the importance of speaking truth to power. On this occasion, Sir Ivan's leaked farewell memo can fairly be read as a protest and a warning. Concern is growing among some high-ranking officials that ministers don't understand or won't admit the scale of the task they're facing. That concern broke surface last week, when the head of the top civil servants' trade union, the FDA, suggested ministers lacked the courage to own up to the difficulties of Brexit for fear of displaying political weakness. Dave Penman's particular worry, as the nearest thing mandarins have to a shop steward, was that ministers might leave the government machine unable to cope adequately with the day-to-day business of government. Of course, trade unions tend to demand more resources on behalf of their members. It's their job. But it was an unusually political contribution from an organisation which represents the most exalted, and rigidly non-political, beings in Whitehall. By extension, if the complaint is justified, refusing to recognise the scale and complexities of Brexit might jeopardise the success of the mission itself. The mere suggestion that senior officials might lack commitment to the task of making Brexit work as a result of political prejudice makes officials bristle. They insist they don't take sides - they take orders and try to make them work. For their part, Brexit enthusiasts insist Britain's future outside the EU is assured, if only all concerned would recognise the strength of the UK's position as a strategic and trading power. Their conviction is strengthened by a sense that the scepticism they detect in Whitehall and elsewhere is not merely faint-hearted or unpatriotic but also undermining to the prospects of eventual success. No-one can say Brexit is coming off the rails. It hasn't even started. But as if preparing to face 27 other European states, the European Parliament and the European Commission wasn't daunting enough a task to begin with, confidence in Whitehall and Westminster about the negotiations and life after Brexit is being undermined by tension between the people who run the government machine and their new political masters - and by old rivalries between Remainers and Brexiteers, even though that civil war was fought, and lost and won half a year ago. In Downing Street the driving motivation is not ideological passion. Theresa May stood on the Remain side in the June referendum, admittedly with no great display of enthusiasm. Her prime concern now is making the plan work. The prime minister is a pragmatist. The trouble with that, just now, is there's no clear sense of what the plan is. We are promised a major speech by the prime minister in coming weeks, giving more detail of the plan for Brexit. Who knows? It may even relieve some of the steady pressure on her and her ministers for more clarity. Given the fact Mrs May and her team above all want to keep their cards closed, and their options open, I'll believe it when I see it.